Police officers in Washington, DC have been hailed as heroes for risking their lives to save a man from a burning car. The rescue mission was captured by Metropolitan Police Officer Steven Hines’s bodycam and shared by MPD on Tuesday. When Hines and other officers responded to the car accident on Monday night, they found the vehicle in flames with the driver still inside. 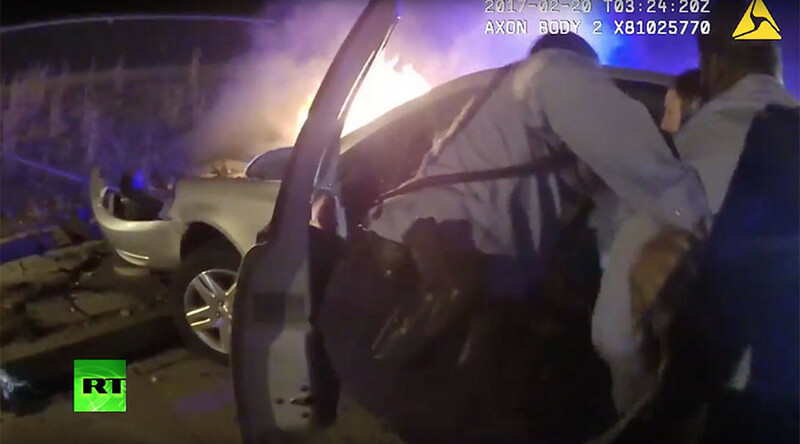 The tense footage shows officers breaking the burning car’s windows in search of other occupants while the unconscious driver is dragged to safety by Officers Jacoby Taylor and Roberto Adams. "Our minds were pretty much on going home. Another couple of minutes, if we hadn't been there, if Hines hadn't stumbled across it, it'd be a completely different story," Officer John Hayes told NBC. “If he had arrived even maybe two to three minutes later, it would have just been too late,” added Sergeant Nicole Brown. The driver was treated and released from a local hospital and the officers received recognition for their quick and thorough response on Twitter.